Phakic intraocular lenses are lenses that are surgically inserted inside the eye ball behind the cornea in front of your natural lens. They do not replace the natural lens. They enhance the focusing action of the natural lens, thereby enabling light to be focused onto the retina. Unlike laser refractive surgery, no tissue is removed from the cornea (front window of the eye). Their main advantage is that they remain permanently inside the eye, and so no ongoing care is needed. These lenses are appropriate for severe myopia where other treatment options may not be suitable. CAN YOU BENEFIT FROM PHAKIC LENS IMPLANTATION? Phakic intraocular lenses are beneficial for those with myopia (shortsightedness). There is no restriction as long as you are an adult and your eyes are healthy. It is suited for those with very high levels of myopia (up to -20.00 diopters). Such high levels of myopia are unsuitable for treatment with laser refractive surgery. If you suffer from glaucoma, you are not suited to have phakic intraocular lens implantation in your eye. WHAT HAPPENS IN PHAKIC LENS IMPLANTATION? Before surgery, measurements of your eye will be taken to determine the curvature of the cornea and length of the eyeball. This is to allow your ophthalmologist to determine which strength of phakic intraocular lens to be to insert into your eyeball. In addition, your eye will be examined carefully to ensure that there are no other problems that could affect your outcome after surgery. Surgery to implant the phakic intraocular lens is quick and takes up to 30 minutes to perform. Local anesthetic drops are usually sufficient to numb the eye and generally no injections are required. A clip is placed to keep your eyelids open, and an incision is made into the eyeball. Depending on the type, the phakic intraocular lens is inserted either in front of the iris or behind it. The lens is attached to the iris by means of a clip mechanism. The wound may or may not require sutures. If sutures are required, these are usually tiny and dissolvable. You may be given an eye shield to wear to protect the eye as it heals. After phakic lens implantation, your eye will feel slightly gritty, uncomfortable and light sensitive for the next few weeks. This will settle with the eye drops that you will be given after surgery. Avoid swimming and rubbing your eyes for a few weeks after surgery. You will usually notice an improvement in your vision within a few days. WHAT ARE THE RISKS OF PHAKIC LENS IMPLANTATION? 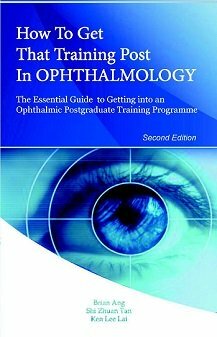 No long term results: Phakic intraocular lenses are relatively new, and so no long term results beyond 10 years are available at present. It is therefore difficult to know for certain what will happen to the eye or the implanted lens over long periods. Cataract: The position of the phakic intraocular lens so close in front of the natural lens means that the natural lens is at risk of developing cataract. 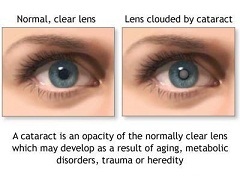 A cataract develops when the natural lens becomes cloudy due either to old age or to some insult to the lens. If the cataract affects your vision, then you will require cataract surgery. Cataract develops in up to 10% after implantation of the phakic lens. 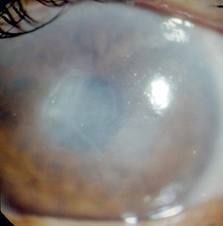 Cataract is a potential complication of phakic lens implantation. 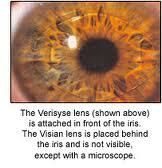 This is more likely to occur if the natural lens is disturbed in any way during implantation of the phakic lens. Corneal endothelial cell loss: The cornea, or the front window of the eye, relies on cells located on its back surface to keep it clear. These cells are the corneal endothelial cells. Their numbers become progressively less and less as we grow older. 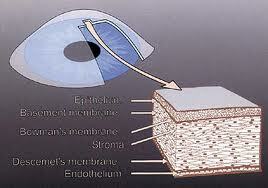 When the endothelial cells are reduced beyond a critical number, the cornea starts to become cloudy. Since phakic intraocular lenses are located behind the cornea, they can cause the endothelial cells to reduce in number. Studies have found this to happen in 5 to 6%. The corneal endothelium is the innermost lining of the cornea and has the important function of pumping out fluid from the cornea. This maintains the clarity of the cornea. Having less corneal endothelial cells reduces the ability of the cornea to remain clear. Acute angle closure glaucoma: Sometimes, phakic lenses can cause sudden rises in eye pressure, especially if you are already prone towards angle closure. If you develop acute angle closure glaucoma, you will experience eye pain, blurry vision and nausea. If you press on your affected eye, it will feel rock hard. You should seek medical advice urgently if this happens so that the eye pressure can be brought down. It is likely that the phakic lens will have to be repositioned or removed. Acute angle closure glaucoma due to phakic intraocular lens implantation is not common, but it does occur in up to 1.5%. Acute angle closure glaucoma occurs when the anterior chamber drainage angles are completely occluded, causing the pressure in the eyeball goes sky high. The vision is blurred because the cornea becomes hazy due to accumulation of fluid in the cornea - this is the result of the corneal endothelial cells being unable to cope with the high eye pressure. In addition to blurred vision, you will also experience eye pain, headache and nausea. Retinal detachment: Like acute angle closure glaucoma, retinal detachment is uncommon (up to 1.5%) after implantation of phakic lenses. The retina is the inner lining of the eyeball that converts light to biochemical signals which are then sent to the brain. We therefore need the retina to be able to see. If you develop retinal detachment, you may see flashing lights, floaters and a shadow or curtain over your vision. You should consult an ophthalmologist as soon as possible if you experience these symptoms. 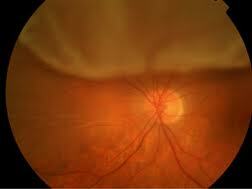 It is likely that you will need surgery to repair the retinal detachment. Retinal detachment may occur after phakic lens implantation. The gray-ish color at the top half of the picture indicates the area where the retina is detached. In this example, the detachment of your retina at the top will result in a shadow or curtain effect at the bottom half of your visual field.